It was another successful day for Heanor Running Club at the Midlands 12 and 6 stage relays. As well as being able to field two full teams in both the Men’s and Ladies events (some 36 runners by my rudimentary maths!) there were some outstanding performances from the Ladies (running over 16 minutes quicker than last year), the Men (qualifying for the National event in 18th place) and the Juniors (silver medals for both the under 13 boys and girls!). It’s a challenging task trying to get the team selection right, long legs, short legs, who’s in form, who’s not, who is racing the next day, preparing for marathons, have I seen enough form in people to make a judgement, last minute drop outs, illness, confidence and desire, deadlines. Anyway, online declarations done, teams announced and social media updated with the information members need, directions, post codes, meeting times, race timetables. The race starts at 11am for the HRC young athletes with the senior men at 12 noon and the women at 12:20pm. Myself and my right hand man (Stealth) arrive at 9am to pitch the club tent (no flag this time) but that’s another story. Tents up, numbers collected and youngsters issued with theirs we retreat to the comfort of the car to sort the seniors numbers, and await the arrival of our Lion’s. Our Youngsters did themselves and the club proud with some very dominant displays especially the u13 age groups with both the girls and boys teams claiming 2nd place and silver medals. The senior men set off (two full teams of 12) and the ‘A’ team comfortably qualified for the final by finishing in 18th place with the ‘B’ team eventually coming home in 53rd place after the mass start when we all lost any idea of position and placings. 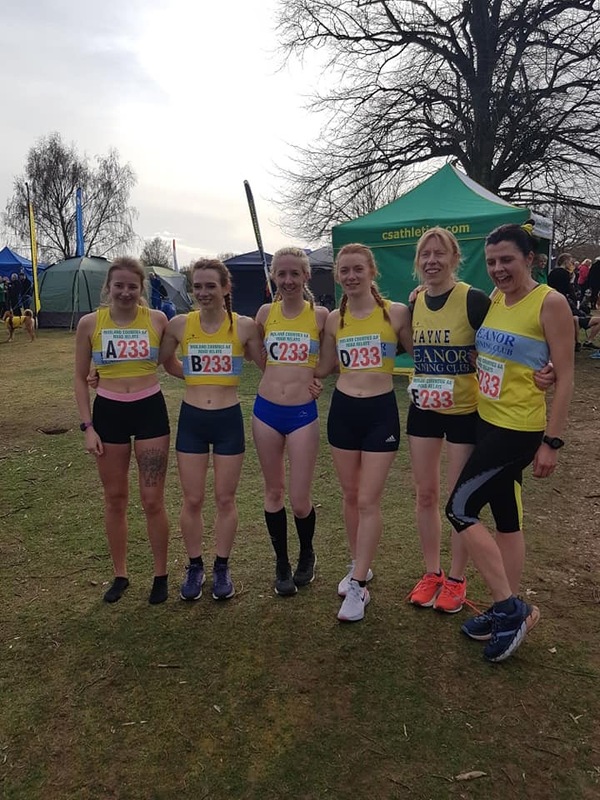 The women (two full teams of 6) set about the course in some style with the ‘A’ team knocking 16:05 minutes of the 2018 total team time to finish 21st team (19th) last year, indicating the upturn in quality at the sharp end. Our ‘B’ team completed the relays with special thanks to Emily who stepped up at the last minute to complete the team despite not having competed for a good 12 months. At a recent XC event I was asked by another clubs official what we were doing ‘right’ by getting numbers out for events like this when his own club couldn’t. Well, the answer was obvious from the word go on Saturday, support, teamwork, a genuine willingness for your clubmate (Male or Female) to do well, no egos or big heads, good old fashioned banter/ribbing and getting the balance right, including our young guns and making them feel a part of the club. When you join our running club you are joining a ‘family’ a close knit one at that.